It was their prize-winning entry to Europan 1 that prompted Ton Salman and Pim Köther to join forces officially. This housing complex takes its name from the previous occupants of a monumental factory building and a water tower originally housing a laundry. Both were incorporated in the complex. 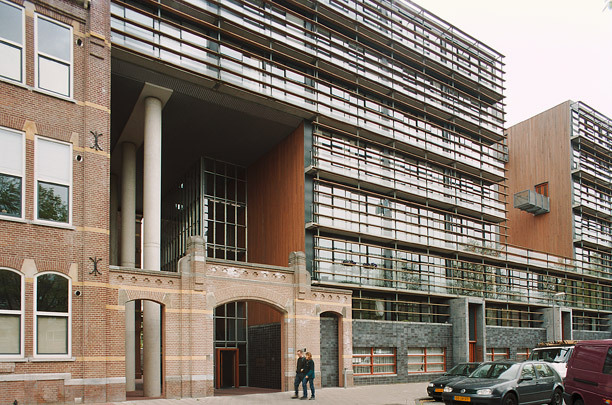 The sheer mass of the block on Sloterkade is softened by a gateway leading in to the courtyard and by a large recess given over to balconies and an aerial walkway. Horizontal wooden slats shade the dwellings from the sun. The facade on the ground floor is of brick with concrete entrances. All units are reached off a central corridor so that they could be made deep and narrow.